Victoria Anderson has finished over 25 events produced by Kinetic Multisports, and is excited to share the outstanding atmosphere at these events with all of you. Regardless of your experience level, the distance you want to race, or the conditions you are looking for, Kinetic Multisports has an event just for you. In addition to her experience on the Kinetic Multisports circuit, she is a multiple-time USA Triathlon National Championship finisher, with five Team USA qualifications to her name. 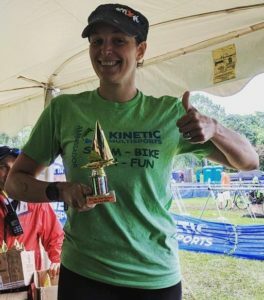 She is active in the Washington, DC triathlon scene, as well as in the national Athena/Athena alum community, and loves that Kinetic Multisports offers the Athena and Clydesdale divisions at all their races. When not swimming, biking, or running, you can find her busy with her work in the nuclear energy industry or spending time with her husband and their two cats.